I had noticed that on Stim Toy Box, there have been more recent posts on the topic of Bouncy Balls. So, I thought I’d share some photos on my own collection of Bouncy Balls. 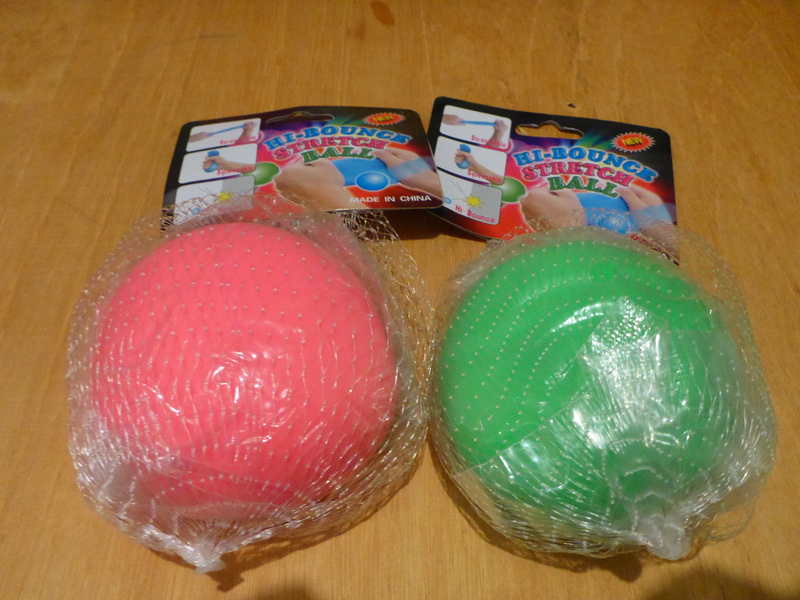 Image Description: from left to right, a pink ball in a clear plastic bag inside a white mesh bag with the cardboard label reading “hi-bounce stretch ball” in blue, pink and green writing, next to the pink ball is a green ball in a clear plastic bag inside a white mesh bag with the cardboard label reading “hi-bounce stretch ball” in blue, pink and green writing. Both of them are resting on top of a wooden surface. 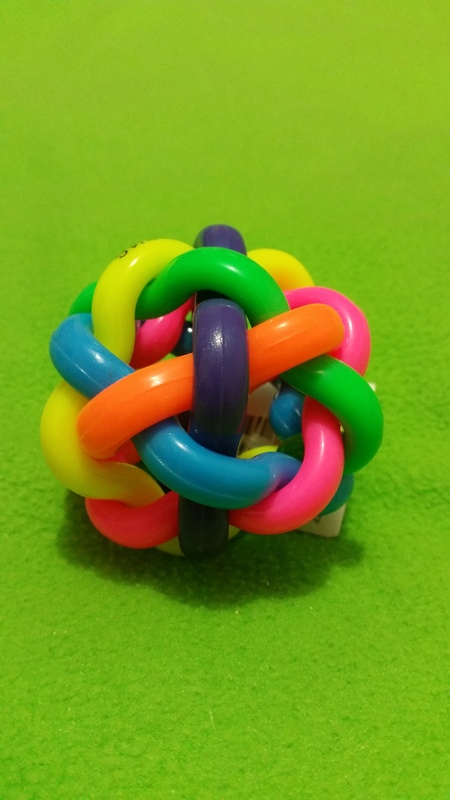 These are Stretchy Squish Balls from Stimtastic. These squishy balls are amazing. It’s one of my all-time favourite stim toys. 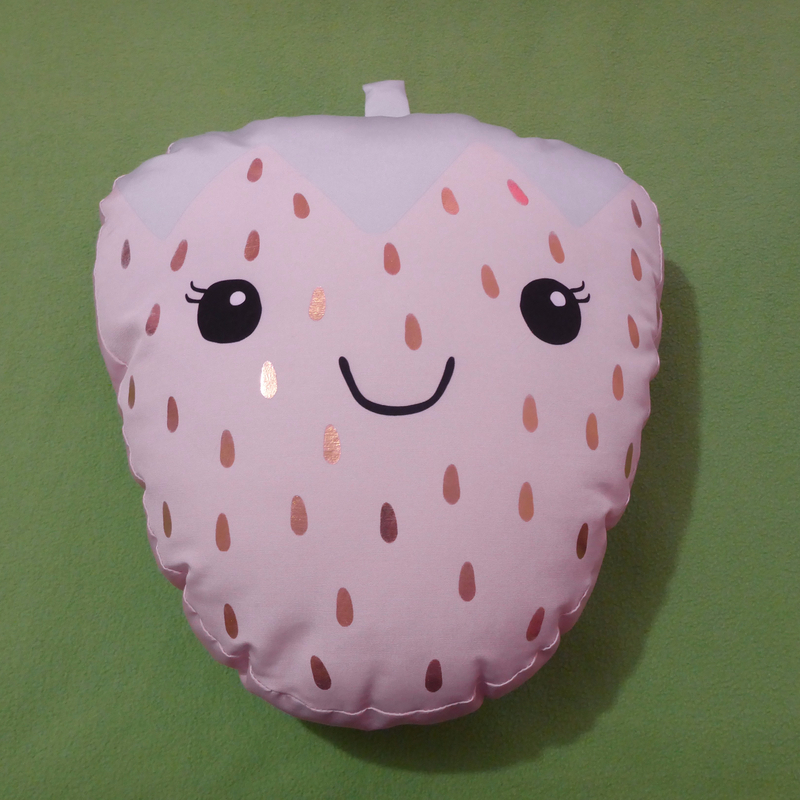 There’s a range of colours but I wanted a pink one, which I love, I keep it inside my on-the-go stim toy bag always. It also helps that my niece loves it as well. They’re usually about AU $01.80 each, which is pretty good considering how popular they are. The only problem is that Stimtastic is located in the USA, which means there’s an AU $08.80 shipping and handling fee attached to every delivery. There’s also the problem that because of the material the ball is made of, they’re also dust magnets as well, so I have to make sure to clean it regularly. Image Description: a Kids & Co large rainbow-string bouncy-ball from Kmart. 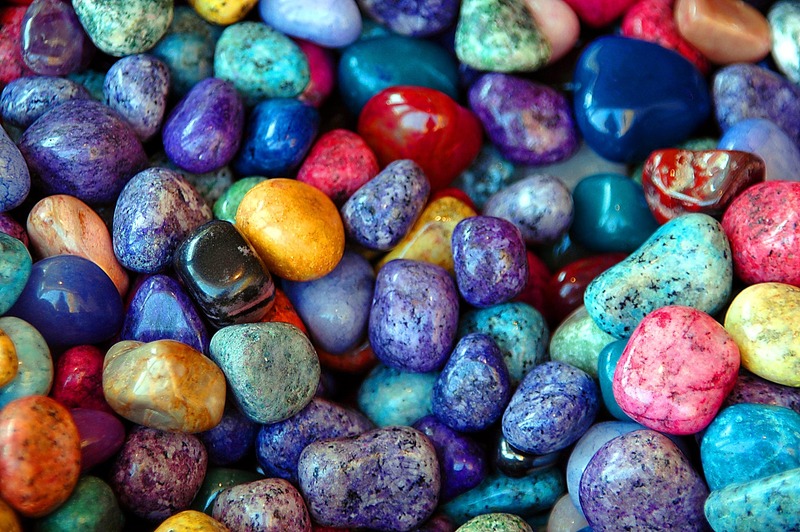 It looks like a bunch of thick plastic parts all woven together like a bouncy-ball of string. There are Kids & Co. bouncy balls, you can get them from most Kmarts in Australia for AU $01.00 each, I really like and enjoy these ones because they’re a lot bigger than your typical small bouncy balls and, due to my terrible fine motor skills, these are a lot easier for me to catch and to grip. This type of bouncy ball is usually a standard gift/stocking stuffer for people I know. I highly recommend these ones. 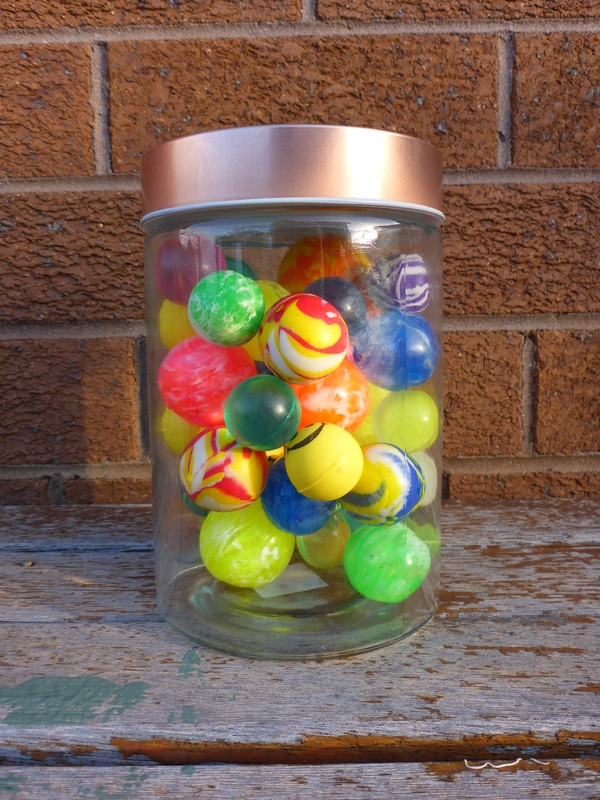 Image Description: The background is a brown brick-wall, in the foreground is a glass jar with a brass-coloured lid, inside the jar is a mixed collection of different coloured small sized bouncy balls. This is my Bouncy Ball Jar-Collection, it normally sits on my PC desk, however, I prefer not to show my desk in its current state as it’s a) a complete mess and b) has stim toys all over it, so you may not even notice the jar on my desk. The jar isn’t quite full yet and I may be able to fit a few more in (for those wondering, I got the jar at Yen Huot Gift Shop in Footscray). 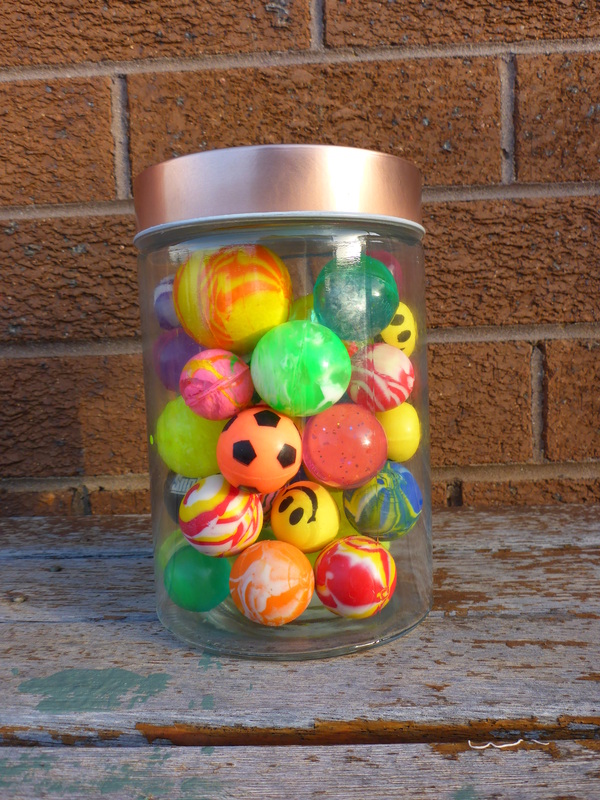 You can also get some of the bouncy balls in the jar from Kmart (make sure to check out the “party” section). So, that’s my collection, if people want to leave comments about their own collection, please do so. If you’ve got photos of your collections, feel free to leave a link as well.